Photographs of a flying squirrel with visuals from the human eye and under ultraviolet light. Credit: Kohler et al. Kohler's undergraduate professor Dr. Jon Martin, associate professor of forestry at Northland College in Wisconsin, was doing an exploratory forest survey with an ultraviolet flashlight in his backyard. Initially, he was looking at different lichens, mosses and plants to see what fluoresced. By chance, a flying squirrel happened to be at his bird feeder. When he saw it under the ultraviolet light, it was hot pink. A team to investigate this discovery was formed and included Martin, Kohler and two of Martin's colleagues at Northland College: Dr. Paula Anich, associate professor of natural resources, and Dr. Erik Olson, assistant professor of natural resources. "I looked at a ton of different specimens that they had there," Kohler said. "They were stuffed flying squirrels that they had collected over time, and every single one that I saw fluoresced hot pink in some intensity or another." In order to expand the search, the team went to the Field Museum of Natural History in Chicago and gathered more specimens. In all, they researched over 100 specimens ranging across numerous states, all confirming their "pink theory." They also looked at five additional live specimens. 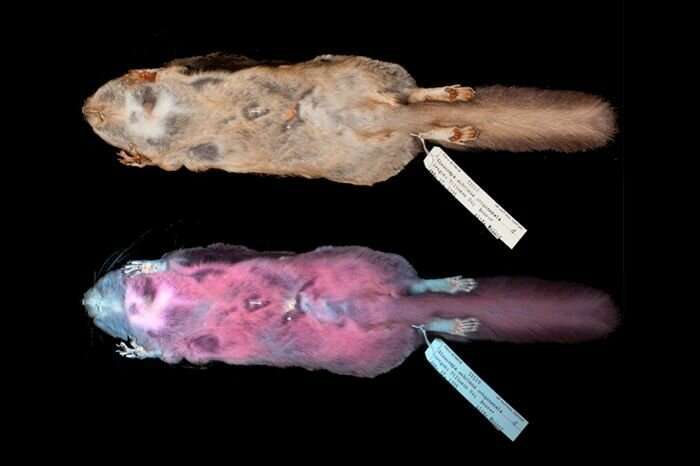 "We tested all three of the North American flying squirrel species: the Northern flying squirrel, the Southern flying squirrel and the Humboldt's flying squirrel, and all three of them fluoresced," she said. "They could be communicating with members of their own species by showing off their fluorescence to each other, or it might be a sort of mating display," Kohler said. "The other hypothesis is that they could be using this fluorescence as an anti-predator trait to communicate with other species, avoiding predation by other species by blending in or dealing with their potentially ultraviolet-saturated environments." As the research develops, she said, the importance of this find will present itself more clearly. Kohler plans to continue her research while pursuing her master's degree at Texas A&M. Further research will look firmly at the implications of the team's find. "It could potentially help with the conservation of the species or other species, and it could also relate to wildlife management," Kohler said. "The more that we know about the species, the more we can understand it and help it. This is opening a new door to the realm of nocturnal-crepuscular, or active during twilight, communication in animals." And it begs the question: can they see in this UV range?